A tangy, colourful and delicious Indonesian style salad that can served as a main dish or by the side. You can also use leftover rice to make this salad. 1. Mix all the dressing ingredients and whisk well. 2. 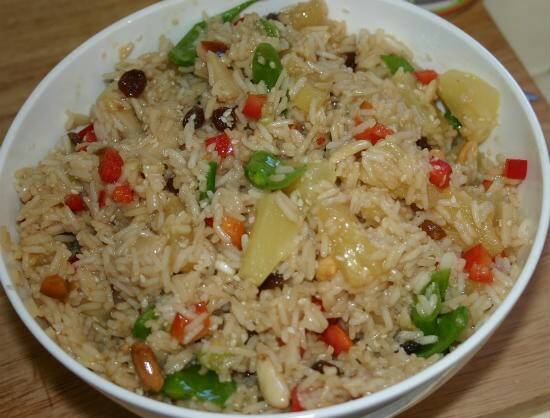 In a large bowl, combine the rice, raisins, spring onions, capsicum, pineapple, peanuts and sesame seeds. 4. Keep it in the fridge for 15 to 20 minutes. Note: Brown rice is commonly used for this salad. Feel free to comment or share your thoughts on this Indonesian Rice Salad Recipe from Awesome Cuisine.